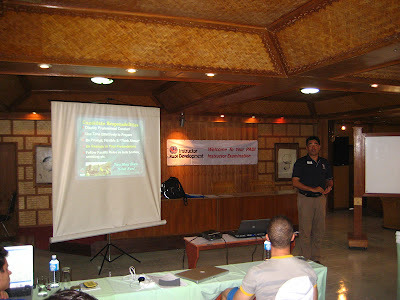 PADI, diving and Instructor Development (IDC) around Thailand: The February IDC finished yesterday and the PADI IE started today! 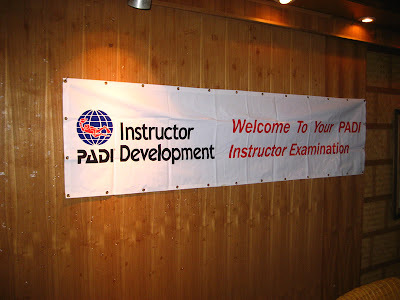 The February IDC finished yesterday and the PADI IE started today! Yesterday everybody completed the IDC program successfully. However, there's no rest for the wicked and today the PADI IE started. This morning at 8 am all 9 candidates gathered at World Resort, where today and tomorrow they will be evaluated by George Wegmann, PADI's examiner on this occasion. The weather is great, it's nice and sunny, for more info on the Samui weather situation, please visit my Samui weather blog. The Introduction is in full swing with George, PADI's examiner, during which George explains what will be waiting for them during the next two days and in the meantime he's also trying (successfully) to relax the candidates a bit. This morning, after the Orientation, they sat their 5 theory exams, followed in the afternoon by the Open Water dive presentation and Rescue skill. The 5 Theory exams were completed without any hitch by all 9 of them, well done! That was a good start. Tomorrow they will have to start in Confined water, for their presentation and in the afternoon they will sit their General Standards & Procedures exam, followed by their Knowledge Development Presentation. Satoshi during his Open Water briefing, Atzumi, Gideon and Adam are also pictured. 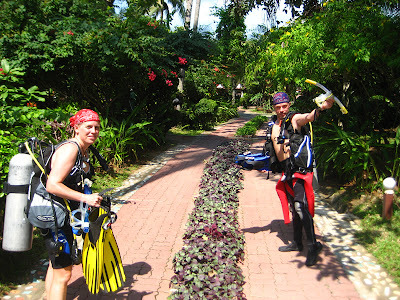 Ulrike and Fred on their way to the beach, for their Open Water presentation. 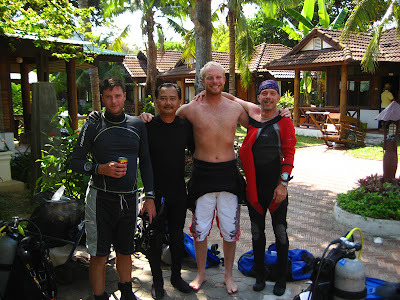 James, Marcus, Simon and Fred amongst their equipment, waiting to get wet for their Open Water presentation/dive. More info and updates tomorrow, so stay tuned!